The month of September, heralding the new season of Spring in the Southern Hemisphere, and the first days of Autumn in the Northern Hemisphere, is one of those "transitional" months when the weather lets us know nature is still boss. Surprising then, that the traditional birth flower for such a momentous month is a very humble one: the tiny, delicate Forget Me Not. like this postcard from the turn of the 20th century. 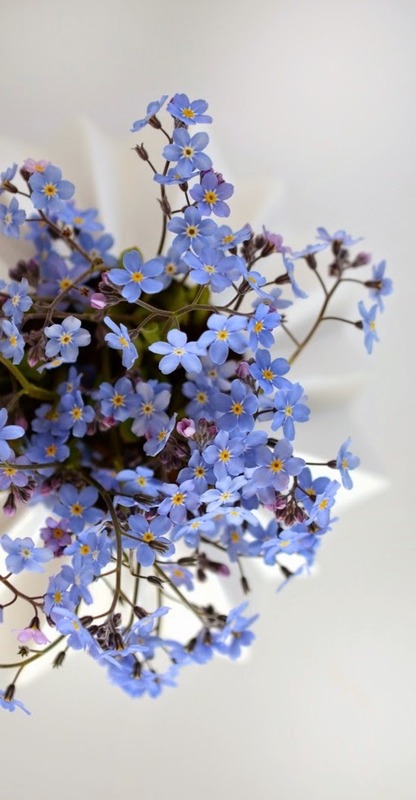 In the traditional Language of Flowers, a gift of Forget Me Nots would suggest the gifter was faithful and steadfast in their love for the recipient. As a birth flower, it carries the same meaning, suggesting people born in September are dependable and loyal. Myosotis (taken from the Greek "mouse's ear", referring to the shape of the leaf) is a flowering plant which belongs to the same family as borage: the Boraginaceae family. More commonly known as Forget Me Nots, which is an English translation of the older French term for the plant, "ne m'oubliez pas" or "don't forget me", these little plants are naturally found in western Eurasia and New Zealand. Forget Me Nots have 5 sepals and petals. They are mostly blue (in shades from deep indigo to pale sky) but also occur in white and pink. Germinating via seed, they can spread voraciously if in a happy spot, but in most gardens they are well behaved if conditions are right. They truly are set and forget flowers, because once they are initially planted in a moist, shady spot, they will re-sow themselves year after year after year. Sow the seed in autumn or late summer, so the plants will be ready to flower the following spring. Forget Me Nots like a moist soil throughout summer - and will tolerate sun or shade as long as they do not dry out. The seeds can be directly sown into the garden, or they can be raised in pots and transplanted in a colder climate. The mouse-ear forget-me-not, Myosotis laxa, has now extended its racemes very much, and hangs over the edge of the brook. It is one of the most interesting minute flowers. Most Forget Me Nots are blue, which makes them a very bee-friendly flower to have in your garden. One of the most famous gardens in the world utilises the understated charm of Myosotis to create botanical magic. Gifting a person born in September with a packet of forget me not seeds would be a welcome gift for a gardener who loves a bit of colour and has a sunny but moist spot in their garden. Once the seeds are sown, each year they will self-sow without having to remember to replant them - hence their delightfully humble name! Most nurseries have packets of Myosotis, so perhaps collect a few packets of flowers in shades of blue from dark to pale, arrange them on a shiny new copper garden trowel, and wrap them all up in pale blue ribbon. 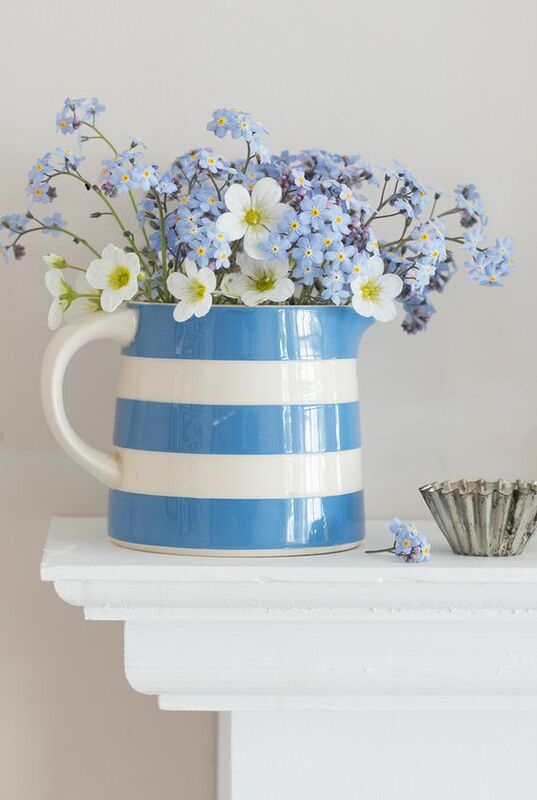 Being blue, Forget Me Nots are very bee-friendly plants too - and a lovely way to add a splash of colour to the garden and some food to the hard working bee family in one fell swoop. So it's a present for the birthday person and a present for the bees. Gifting these seeds is also a delightful way to tell the recipient that they too, are too lovely to forget. IMAGES: 1st Forget Me Not flower image from Lambley Nurseries; jug of Myosotis; fern & flowers; vintage postcard ; bouquet of Myosotis; pink and blue Forget Me Nots; Forget Me Not tatoo; stars of blue; Monet's garden at Giverny.